Okay, I'm rounding up, but 1384 still seems like a helluva lot! I really have been grinding like crazy since I got back from Vienna. It was especially hard because I simply wasn't making any money, but I tried not to loose too much faith because I was owed a ton in EV. 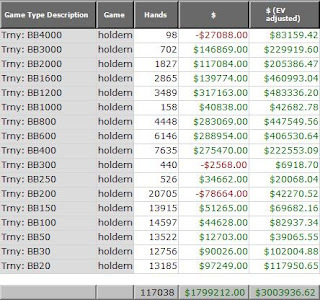 Although adjusted EV is something which is very useful for seeing how you are running in cash games, it's perhaps not as useful in SNGs. This is because it's hard to work out what the difference between the chips you have won and the chips you would have won had your luck been average in all-in situations is really worth. At least it's there to stop you going out of your mind when you are running bad. 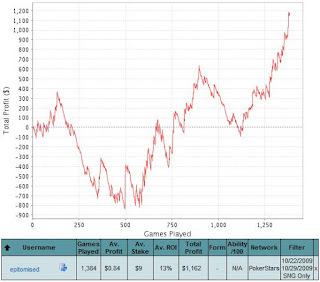 I think my choice to play some 180-mans was bad, as these require a different strategy to the 18-mans and 45-mans that I have been used to, so that $600 I lost in 85 $12 games was a bad experiment. Especially considering I had dismissed playing these because of the variance in the past. The last few days have been really rough, as I have complaining about, but I finally had a super-good day today, which I definitely feel like I was owed. But just because you feel like you are owed a good day, doesn't mean you won't run bad for another week, so I'm just grateful things went right today and has perhaps given me a better mindset for the continuing grind! I'm still going strong with playing essentially as many 45 man SNGs as I can throughout the day, literally doing a "9 to 5" (and consequently eliminating one of the perks of playing poker for a living!). I've clocked in between 200-230 each of the last four days. I'm hoping that my graph of 45-man tournaments is enough to keep me motivated to keep churning out such a ridiculous volume of games. 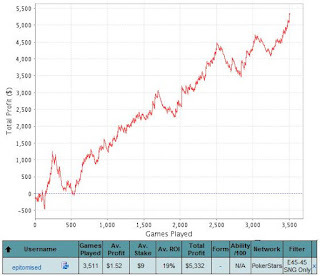 All 45-mans played on PokerStars, lifetime. 7 Comments to "1400 SNGs in the last 8 days..."
Sick volume, my head would be seriously fucked if I played anywhere near that amount, though I wish I could purely from a money making point of view. Hey James, added mate...thansk for the add too. Liking your blog skin mate...where you get it? have linked you up m8. 1400 in 8 days? That's how many at the same time? I'm lucky if I can 25!!! in a WEEK. On the other hand, great results! I myself also do prefer the 18 and 45 seaters above the 180 ones, where the top money is only in the top 2. Thanks for the link ups. I play a max of 22 at a time. Which usually means I'm playing somewhere between 18-20 at once. Have got a nice set-up though and it isn't too much trouble, although sometimes you get fold happy and I have now folded Aces preflop twice by mistake!